The Capital City Arts Initiative announces its exhibition, Works: Some Water Some Welded, with artwork by artists Susan Glaser Church and Stephen Reid at the city’s Sierra Room located in the Community Center, 851 E William Street, Carson City. The exhibition is available to the public from March 2 ”“ June 30, 2018. CCAI will host a reception for the artists on Friday, March 2, 5-7pm in the Sierra Room. Susan Glaser Church, a native Nevadan, was raised on her family’s ranch East of Elko. The junkyard was her playground, and it was there that she developed an interest in rusted and repurposed metal. 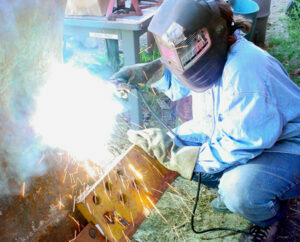 She learned to weld while helping her father repair damaged machinery during the haying seasons. She studied at the Academy of Art in San Francisco and joined the California Blacksmith Association and expanded her tools to include some metal forge work. Now that she’s living back on the ranch in eastern Nevada, found objects and fabricated metal have become the basis of most of her work with a theme of rural issues often running through her sculptures. To create her art, Church uses traditional forging, plasma cutting, and MIG welding. Stephen Reid is an artist living in Dayton, Nevada. His work spans the disciplines of painting, sculpture, installation, and printmaking. While living in Japan, he became aesthetically drawn to Sumi-e drawings and their humble figure/ground compositions. This led to the use of ink and watercolor to investigate the Self through viscera and absurd conditions. This body of work is further influenced by Reid’s exposure to various physical and psychological traumatic occurrences, experiences that have fueled an exploration of competing concepts: vitality and mortality, beauty and repulsion. Through abstraction, these images provide an interesting minimal space for inquiry. Reid received his B.F.A. in Sculpture from Virginia Commonwealth University and an M.F.A. in Sculpture from the University of Massachusetts at Amherst. While pursuing a career in art he has held numerous positions including the military, aerospace, teaching, and currently, working for the Nevada Arts Council. Reid’s work has been shown in the U.S. and Japan. His paintings reside in the VCU Medical College as well as several private collections.